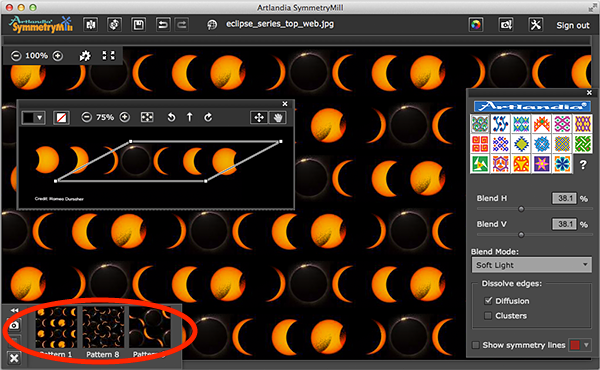 Want to export all the patterns in your current snapshots set in one go? With the just-released SymmetryMill 2.1, you can. The Export dialog now has the Export Snapshots button that lets you choose a folder and then automatically save all the patterns (or tiles) in separate image files. 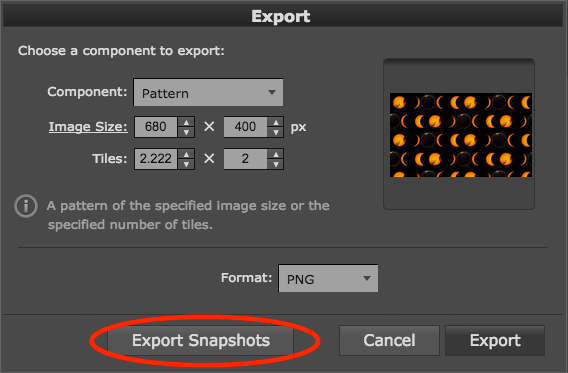 The Export Snapshots button in the Export dialog. Additionally, when saving patterns, you can specify the target pixel size or the number of tiles in the horizontal and vertical directions. So it is now easy to save images of a fixed size (say, 100 ✕ 100 px) or images that contain exactly 2 ✕ 2 tiles. Specify pattern size in pixels or number of tiles. See Saving (Exporting) Patterns for details. Download the new version from the usual place: Download SymmetryMill.